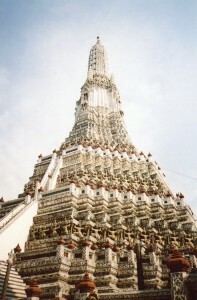 Bangkok’s Wat Arun was named after the Indian god of the dawn (Aruna) for good reasons. It symbolized the founding of the new Thai capital across the river from where Bangkok would grow after the Burmese had destroyed Ayutthaya (the old capital) in 1767. To signify the new beginning, Thais brought their traditional art forms to perfection, and they’re a fascinating comparison with Western art forms. 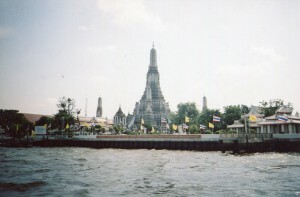 Wat Arun was built by the Chao Phraya River, so its visage is closely associated with a river’s flow. People often approach it in boats. 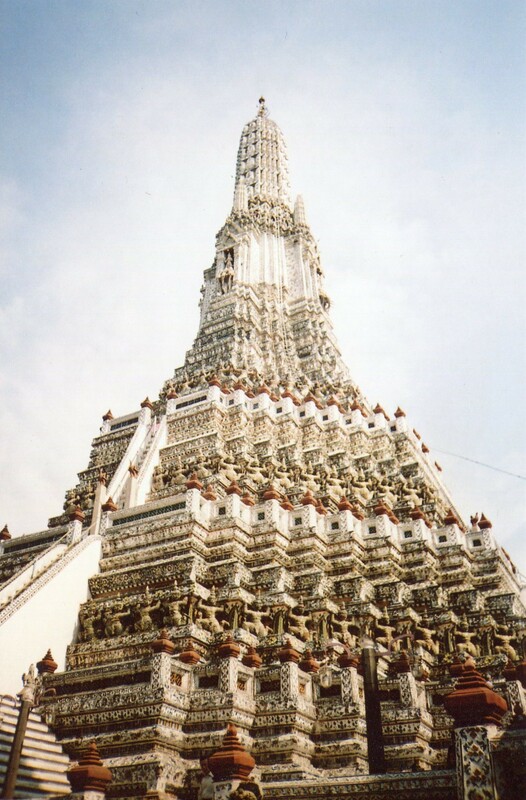 So Wat Arun’s rippling form isn’t like the static lines and arches in Western architecture (like Pisa’s cathedral). Instead, it ripples, as though the river’s flow and the Buddha’s compassion tame the powers in nature. 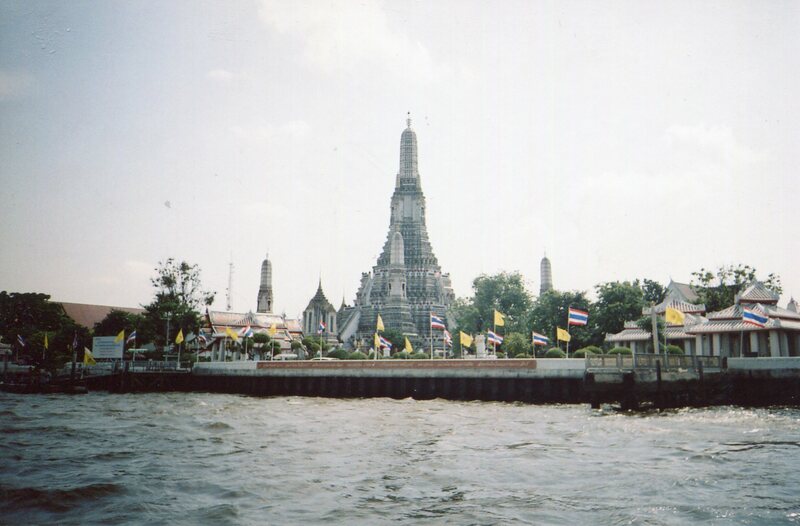 But Wat Arun’s form wasn’t just pulled out of the clouds. Thin shrines that ripple like rivers and gently curve as they rise were forms that Thais developed and increasingly varied from their independence from the Khmers in the 13th century through the 16th century. The stupa in the above shot is from Si Satchanalai, an important satellite ritual center within the Sukhothai kingdom, which thrived north of Ayutthaya in the 13th and 14th centuries. 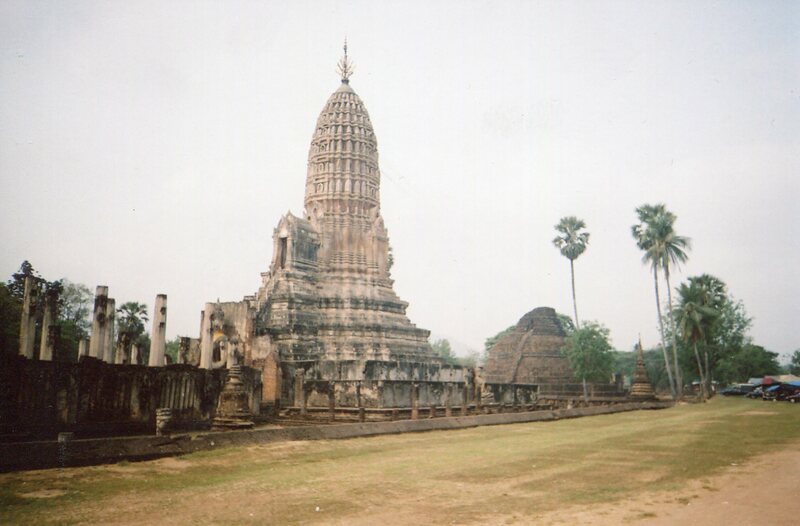 Its glorious crown is in a style which Ayutthaya developed in the 15th century–when Florentines were developing three-dimensional perspective. 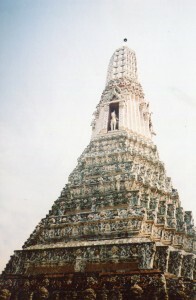 Many varieties of the flowing Thai stupa were created before Wat Arun was built. This is one of the world’s most under-appreciated art forms. But I’ve never seen a more graceful Thai shrine than Wat Arun. It begins as a broad base, and it steadily becomes narrower until it dissolves into the heavens. Its gently curving outline seems as smooth as silk. The several indentations in each corner look like ripples in water. As Bangkok grew into a simmering concrete dragon, Wat Arun provided a model of timeless truth. Thais prefer non-confrontational behavior, and they sometimes find the West’s focus on lines and planes too blunt. The most enduring forms that Thais organize their thought around harmonize all the forces and spirits in nature. Wat Arun is a masterpiece because it balances them–earthly dominion on the bottom, the heavens above, and a transition between both that ripples as softly as the rivers that Thais have settled by since ancient times. But we’ve only seen Wat Arun’s outer forms. We’ll explore some of its inner enchantments in the next post on Wat Arun.